Breaking a world record is possibly one of the most remarkable thing any one can ever achieve. Records can be extremely diverse, ranging from physical feats to manic mental accomplishments, from doing it alone to breaking a record in a group. Individual records can be relatively easier to achieve because you need to count on only one person to make things happen – yourself. When you attempt to break records using a team, you need to focus on coordination and execution beyond anything else. 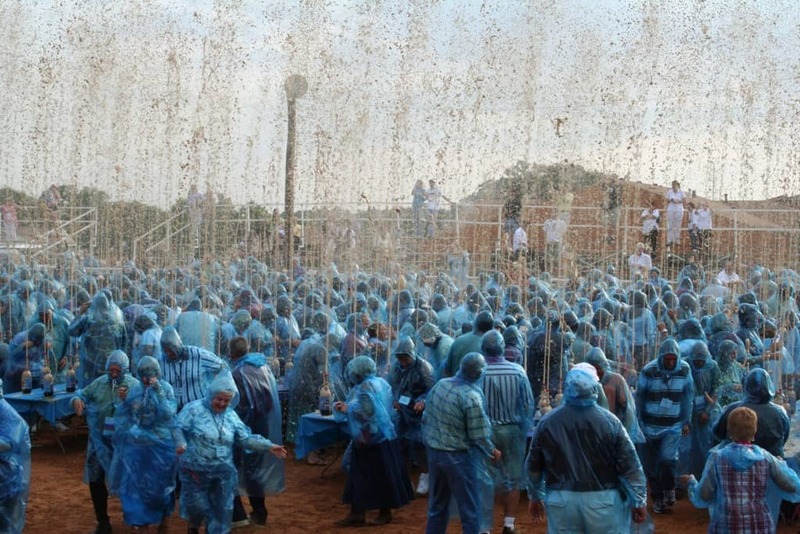 This list includes 10 crazy world records that involved mass participation. Sometimes, you need to bare your soul in order to breakthrough a massive barrier. In this case, all these people had to bare was their skin and the record was theirs. Cosmos, a cancer society, got together 146 volunteers, who showed up only in underpants in order to raise money and awareness regarding the cause. 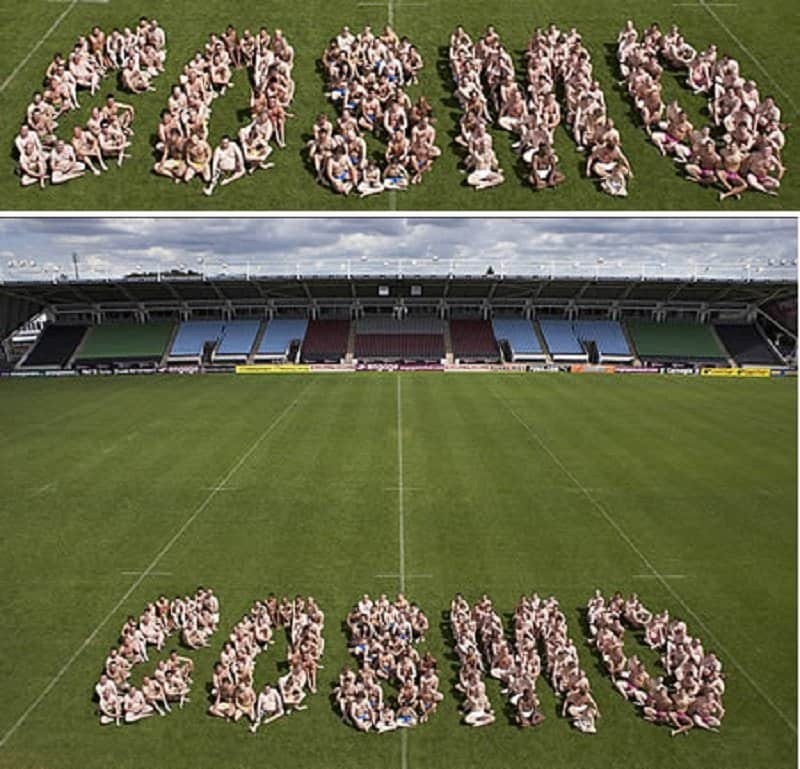 This record was broken on a rugby ground at the Harlequins rugby club. As kids, most of us have attempted to convert an ordinary bottle of coke into a gaseous explosive device by adding a Mentos. A group of 1,500 students created a world record by launching a simultaneous explosion using 1,500 individual bottles of coke, thereby recreating our childhood vision in the most spectacular way possible. This event occurred in Leuven, Belgium. 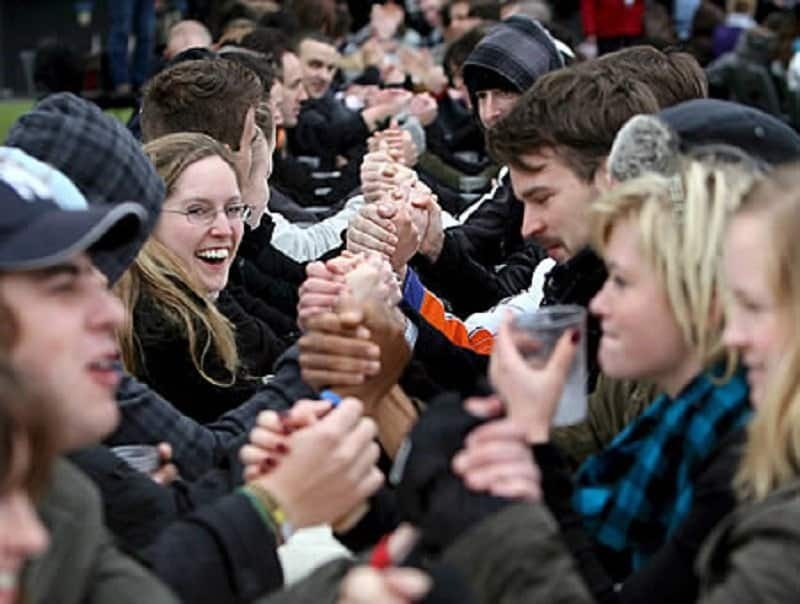 The largest arm wrestling contest was conducted in London where over 200 people turned up to lock arms and break the previous record. A good way to break the news to children that Santa isn’t real, is by taking them to the largest gathering of Santa Clauses in the world. 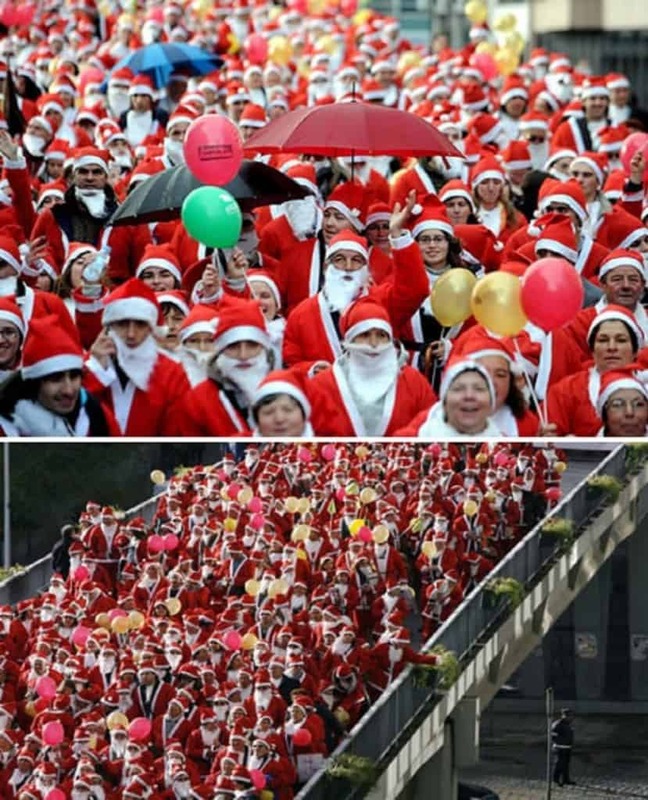 In the Portuguese city of Porto, nearly 15,000 people turned up dressed as Santa Clause and took to the streets to raise money to buy gifts for the needy children in the region. There is so much aggression and conflict in the world, that it is nice to see a record broken that is totally based on love. 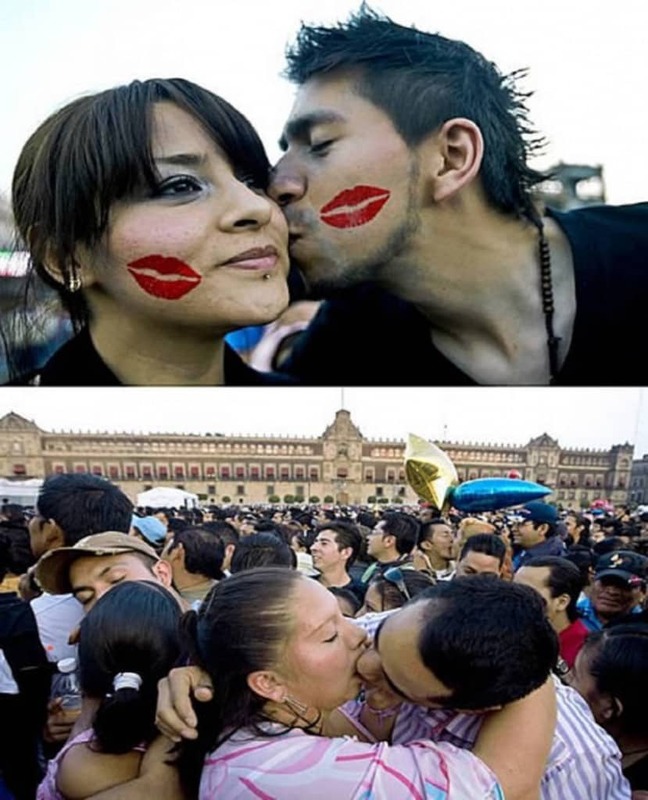 Nearly 40,000 people gathered in Mexico and locked lips in an attempt to break the record for maximum number of people participating in collective kissing. This was also a gesture by the citizens to show their unity amidst a massive drug war that left behind thousands of victims. 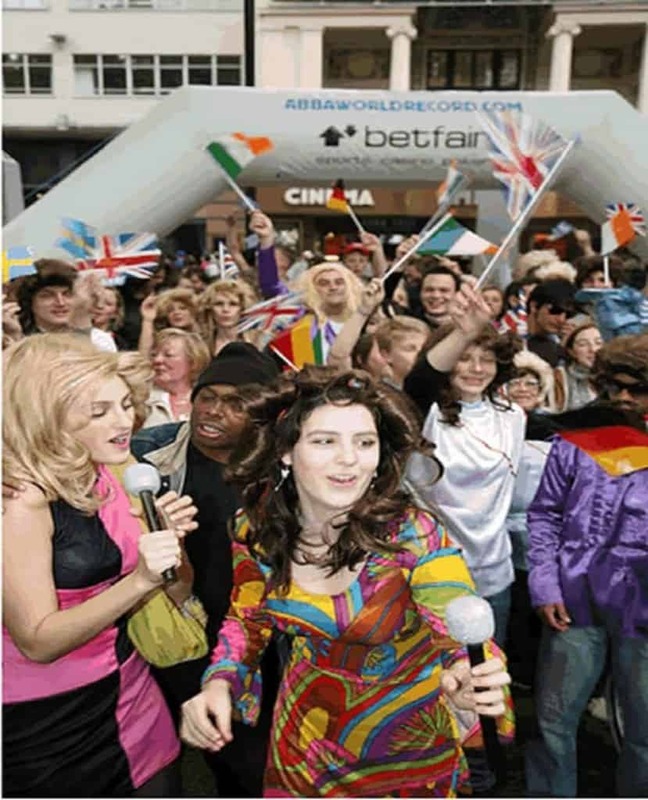 ABBA is a band that has numerous fans around the world. A small section of their entire fan base decided to break the record for largest gathering of ABBA impersonators. Over 150 people participated in this event that was conducted in Waterloo, in London’s Leichester Square. A ‘Bride Parade’ was organized in Bucharest in order to promote the institute of marriage in Romania. Nearly 100 women dressed entirely in bridal attire turned up for the event, making it the largest bride parade in the world. You would think that fitting one person inside a soup bubble is hard, but this world record makes a mockery of that feat. 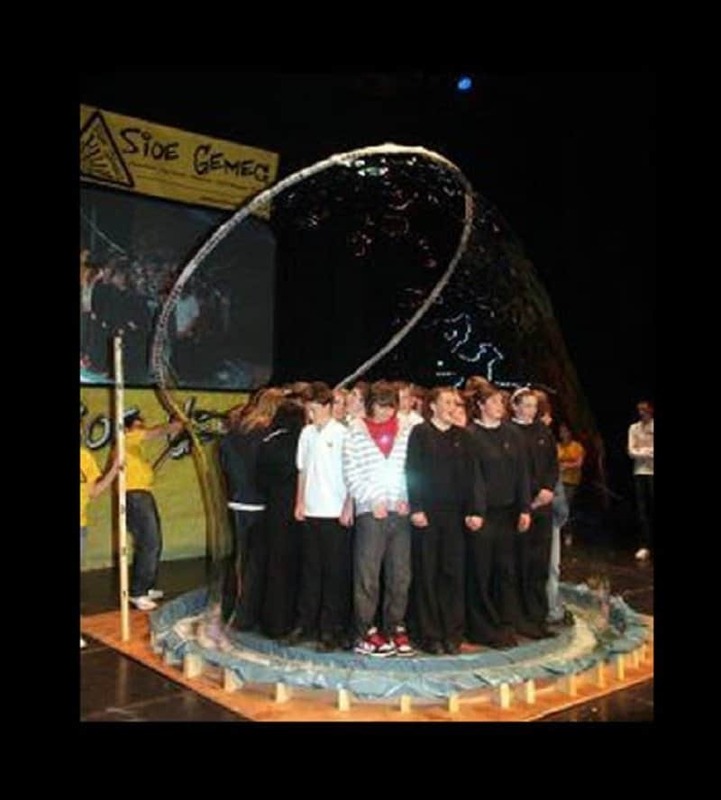 Dr Robyn Weldon-Williams broke the record for most people inside a soap bubble by fitting 59 children inside on bubble. This gigantic bubble was created using a mixture of warm water, washing liquid, glycerol and another secret ingredient that hasn’t been revealed. Can you find Waldo in the above picture? Of course you can, because this is the record for largest gathering of people dressed as Waldo. 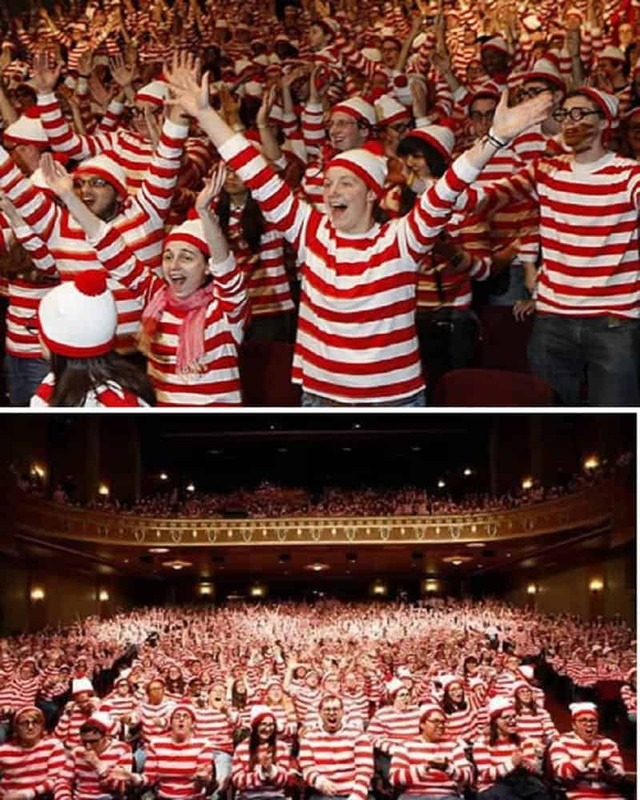 This strange record was broken in New Brunswick, N.J when 1,052 Rutgers students turned up dressed as Waldo. The previous record was held by a group of 577 people. The ‘Smurfs’ have become an unforgettable part of popular culture and regarded as an iconic set of characters around the world. 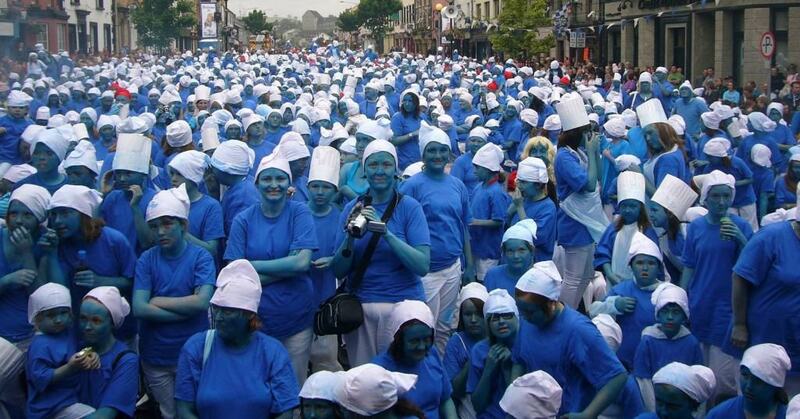 Swansea decided to break the world record for maximum number of people dressed as smurfs by getting together a massive group of 2,510 people. Most of these people were from local universities and they gathered in the Oceana nightclub while breaking the record with nearly twice the number of people as the previous record.